As a new mom, it’s more important than ever to keep things simple! 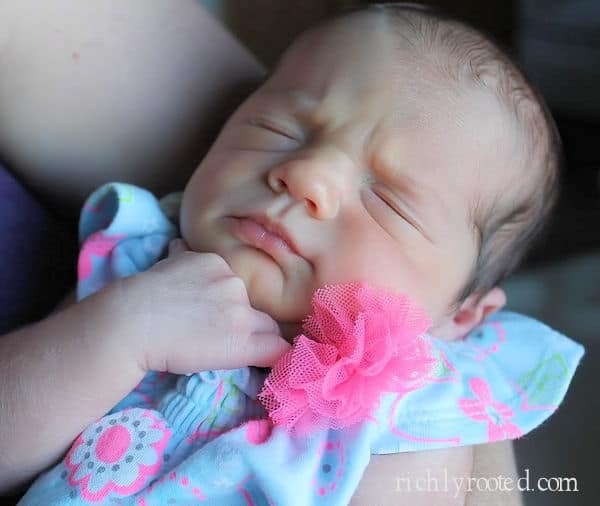 Here are 10 ways to find simplicity in the newborn season, so you can savor this time instead of letting it overwhelm you. Readers, I’ve missed you! As many of you know, we recently welcomed a new little boy into our lives! I am taking a blogging rest in order to get to know this little guy, so my friend Sarah of Grounded & Surrounded is stepping in with a guest post today. I really love this post–it has encouraged and blessed me in this season, and I hope it will bless you, too! Sometimes it is the simple things that complicate our lives more than anything else. It is simple to fall in love, but complicated to build a life with the person you love. It is simple to say YES to a puppy, but complicated to train that puppy not to eat your couch. The idea that something is going to be simple can cause us to say YES when in reality we should be saying NO. What is simplicity and is there value in taking the time to redefine it for ourselves? I am the master of taking something that should be simple and complicating the heck out of it. Many times I start with a simple four-ingredient recipe, and by the time I am done it is a mish-mash of fourteen different items that just “needed to be used up.” I am always finding ways to complicate relationships, too. Don’t you dare try to make plans with me by texting! It will turn into a two-hour back and forth of epic proportions. Simplicity is something I am always striving for but rarely succeeding at! Elsie has just entered a new and exciting season in her life. I literally begged her to write a post about babies and motherhood, because it is such a precious gift to be a mom. My two baby girls are now 6 & 7 and have been out of diapers for quite some time. But as I think back on that season of my life when I had two babies under the age of 2, there are so many things I wish I had done differently…and just a few I did right! I can’t go back in time, but maybe my advice and encouragement can help Elsie and anyone else who is transitioning from one season of life to the next. Change is difficult and far too often we just keep on trying what we know rather than adjusting our approach. As we navigate through the different seasons of life, I feel that it is important that we redefine simplicity for each season. The strategies you used to live a simple life when you were single won’t work so well once you are married. The same goes for new parents and empty nesters. As the seasons change, so must we! When I became a new mom, it seems like everything I thought I knew about simplicity got thrown out the window. Not only was I operating on no sleep, but every system I had in place to keep my life organized didn’t seem to apply anymore. 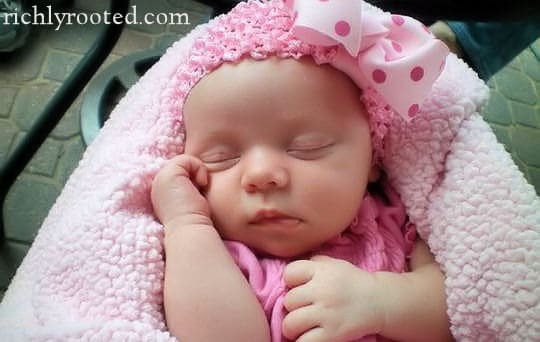 That adorable little baby that I had patiently been waiting for complicated my life in a way I never expected. 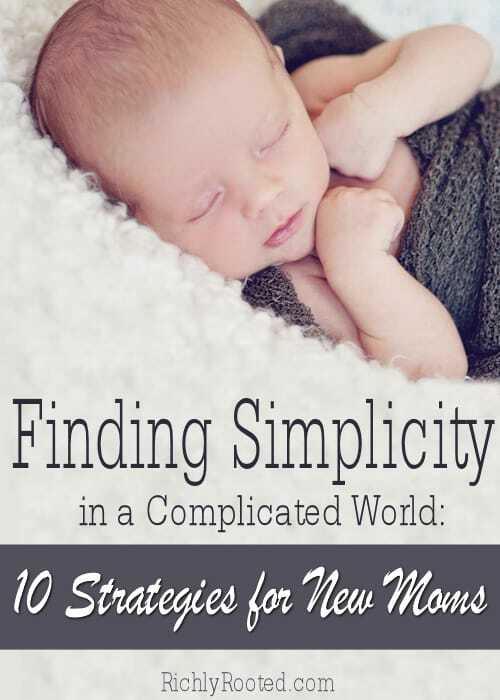 Here are my top 10 Strategies for New Moms; I believe you can find simplicity in a complicated world! Everybody knows they are going to be sleep deprived when they have a baby. But taking the time to sit down and make a “Sleep Strategy” with your spouse will change everything. Our plan to share the nighttime responsibilities literally saved my life when my baby first arrived. I would wake up to feed the baby and then my husband would take the baby in the other room and help her back to sleep. If you have trouble falling asleep at night, here are 20 ways you can induce sleep naturally. 2. A stocked freezer is a LIFESAVER! I made a point to stock up my freezer with prepared meals in the months leading up to the birth of both my children. These meals were simple to defrost and make for my family during the busy season of caring for a newborn. Here’s a list of ten make-ahead breakfast freezer ideas! God blessed you with that baby. The learning curve is steep, and you will fumble from time to time. Don’t doubt yourself. Trust your instincts, and DON’T APOLOGIZE for mothering in the way that you feel is best for both you and your child. 4. Develop a NEW approach to housework. I like a spotless house as much as anybody, but I had to learn to lower my standards once I became a mom. Over time, I developed a simple strategy for controlling the clutter in my home. You can read about it here. New moms get advice thrown at them from every which way. I encourage you to choose a few people to confide in and seek counsel from, and just smile and kindly nod at everyone else. A simple thank you is all that they need in response. You won’t feel so pretty at times, you will mess up and snap at your husband, you will cry when your baby cries. I was an emotional mess after I had my babies. Forgive yourself for not being able to be the person you once were, because when you let her go, you will discover a whole new you that is worth getting to know. 7. Take TIME for your husband. He is going to miss the old you, too. Don’t forget that his needs don’t disappear with the arrival of the baby. I remember our first date after our eldest daughter was born. We truly didn’t want to leave her, she was all we talked about and thought about while we were out, and we couldn’t wait to get back to her. But it was still good for us to take the time to get away as a couple. No matter how much it will feel like it, your needs don’t disappear with the arrival of baby either! They definitely take a back seat for a while, but you will do well to at least attempt to eat, shower, and have one grown up conversation each day. My local MOPS (Mothers of Preschoolers) group was a lifeline for me when my babies were little. Here’s a big list of other simple, doable ways to practice self care. Those jeans just plain aren’t going to fit you for a while. And that little is worth it! Go out and buy some “transition” jeans (no matter how hard it is to accept the size) and allow your body to rest and heal from the pregnancy. Eat as healthy as you can and work on adding movement into your day-to-day life. But make sure you have realistic expectations about those skinny jeans! I speak from experience when I say that this season will come and go far too quickly. It is so tempting to try to rush your child onto the next developmental milestone, but don’t make the mistake so many first-time parents make. There are no other seasons in life like this one. Treasure it, soak it up, breathe it in. For all too soon, you will be trying to navigate the waters of preschool! If I could go back and do it all over again, I would have simply had more grace for myself. I wouldn’t have pushed myself so hard, trying to be the perfectly put together mom. I would have rested more, complained less, and held my babies until they were old enough to ask me to put them down. There is so much pressure placed on new moms, and navigating those waters for the first time can be overwhelming and complicated. You can make the choice today to redefine simplicity in your own life no matter what season you are in. 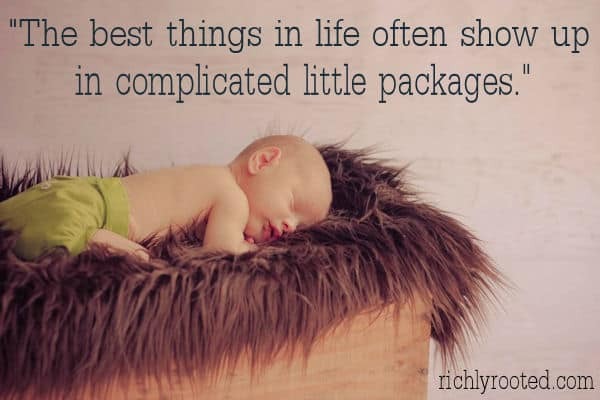 The best things in life often show up in complicated little packages, but once you open them and organize them, you will discover that they aren’t so complicated after all. Are you still waiting on your little one to arrive? You might enjoy signing up for these FREE week-by-week pregnancy updates! 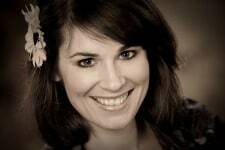 Sarah Koontz is a stay-at-home wife & mother of 2 beautiful little girls. She is passionate about writing, and loves sharing her advice and experiences with anyone who will listen. She has a blog with her best friend Sammi at Grounded & Surrounded where they write about all things Healthy! Heart, Home, & Habits. You can find Sarah on Facebook , Twitter, Instagram and Pinterest. Sarah and Elsie, great tips! Especially numbers 5 and 7. I wish all of us with new moms in our circle would stop whenever tempted to offer a helpful hint and ask ourselves “Is the way New Mom is doing Blank harmful to the baby or simply “not the way I would do it”? If it’s not harmful, let’s just keep our mouths shut until we’re asked for advice! I have been having babies for 2 decades and this is all great advice! When I started having babies, the internet really wasn’t around. If you needed advice, you found a real person to ask. Now forums and face books groups are available, and I think that moms have learned not to trust their instincts. Everyone has their opinion and there seem to be “rules” to follow. That’s why I really like #3. Yes, there is a huge learning curve when a baby arrives, but believe in yourself and your mommy instinct. God gave that baby and you will learn to trust that voice. For example, I had a very high needs baby. The kids that would little nurse all day and want to be held only by mom – 24/7. I sought advice and many said that I was spoiling her and to let her just cry it out. Yet that inner voice just told me to get a good baby carrier and keep her closer than ever. She is now 7 and looking back I know I did the right thing. It was so hard, but it is what my baby needed and I am so glad I listened to my mommy voice. She is a confident little girl and we have a very close relationship. YES. This this this. It is so hard to allow for grace when it seems you never even get time to think! I’m going to definitely work on this after our twins are born this Fall. Congratulations on your upcoming twins! What a beautiful blessing! I loved this post from Sarah, too! I felt like even when I had time to think, I couldn’t think straight! (: Yes, grace is needed!